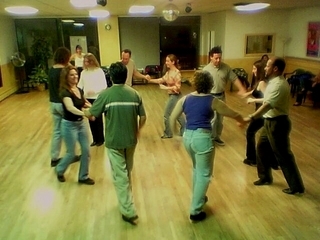 Miami Salsa will be teaching 4 beginner classes on Mondays through Rocky Mountain Singles beginning on April 6th. They will be held at at 2828 N Speer Blvd. Contact Rocky Mountain Singles for more details. We offer private lessons for individuals to large groups (click here for pricing). We teach at our location in Thornton, or at an appropriate space near you. We can really help you become an advanced salsa dancer. We can also help you choreograph a routine for an event such as a wedding or birthday. We can teach you rhythm, moves, and style. You will have it all by the time we're done. Our focus is in creating dancers who really know how to lead and follow. Good leading and following techniques are so crucial to really being able to dance, and if you can do it well, you will go far. These classes will be small for good reason. We really want to work intensively with each of you. With only 10 spots available in each class you can bet they will fill up fast. Contact us for the current workshop schedule. Group classes comming soon! Contact us to subscribe to our email list.